Gabriella M. Belfiglio was born in Philadelphia, PA, the youngest of four children. After graduating from Antioch College with a BA in poetry, she moved to Brooklyn, NY, which has been her permanent home ever since. After years out of school, she attended American University, earning her MFA, also in poetry. Gabriella is an artist, political activist, and aspiring yogini. She holds several jobs, in order to keep writing a priority in her life. She teaches karate and self-defense for the Center for Anti-Violence Education, and she is part of the teaching team at Brooklyn Society for Ethical Culture’s Children’s Sunday Assembly. She is also a fishmonger at the Grand Army Plaza greenmarket. 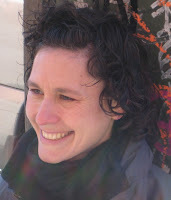 Her work has appeared in several journals and anthologies, including Folio, The Centrifugal Eye, the award-winning Poetic Voices without Borders, and most recently, Avanti Popolo.